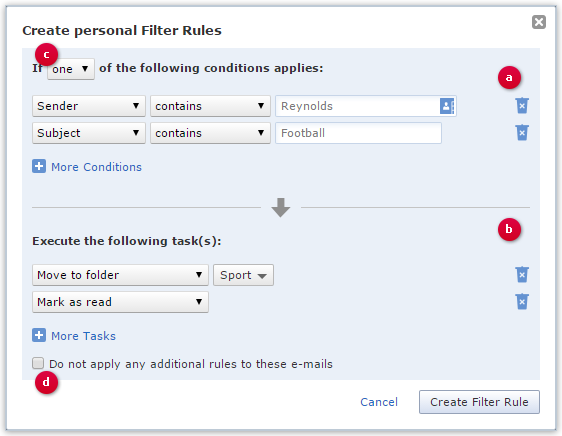 If our suggested quick filter rules does not suit your needs, you can add custom filter rules. Custom filter rules can be more complex. If none of the suggested quick filters are suitable, you can also create a custom filter. When doing so, you can choose which conditions (a) trigger which tasks (b). You can also create combinations. You can choose whether one or all of the conditions must be met using the list field (c). When you save ("Create Filter Rule"), the system checks whether your filter rule makes sense and whether it may lead to an unwanted loss of data. Filter rules can also contradict each other. You can avoid this by selecting the option "Do not apply any additional rules to these email" (d). If you are unsure whether the filter rule is working as planned, you can test it first: do not delete the affected e-mail; instead, move them to a folder. If no misdirected mail arrives in this folder after a test period, you can use the filter rule as planned.